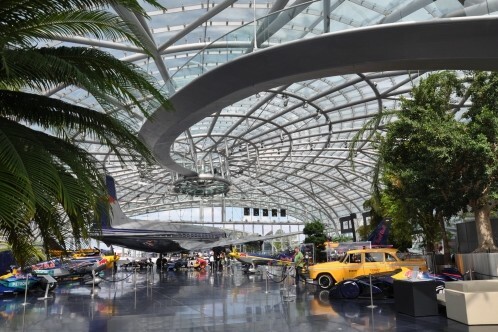 At the eastern part of the airport area the Red Bull company is going to build a new hangar. The ellipsoidal hangar is about 110m long, 77m wide and 15m high. Red Bull old timer, airplanes for shows and air events will be presented over an area of 4000 square meters. At the same time the airplanes from the Flying Bulls will take place in the light-flooded hanger. Later on the hangar is going to be opened to the public as an museum. 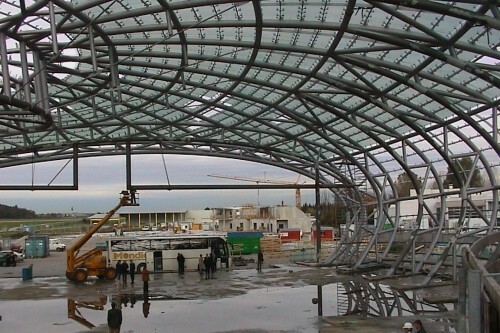 The primary structure consists of inrespect to the central ellipse, radial oriented main girders and ellipse rings. 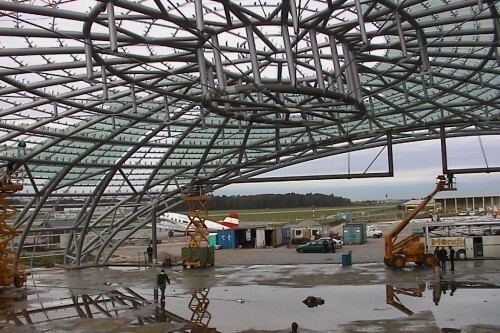 The main girdes are designed at the support zones as trusses. 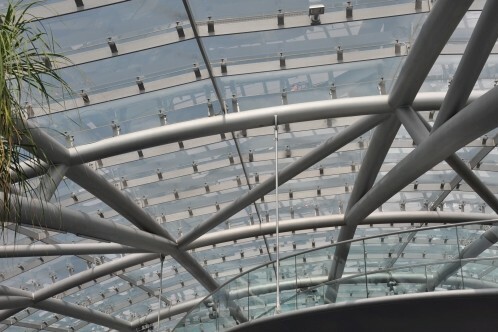 At the central ellipse the main girders are connected by rods to the lower edge in order to prevent snap through failure. The picture is braced by two bracing rings. At the hangar gates the main girders settle on the gate arches. The secondary construction which is a grid made of steel plates will be fixed at the primary construction. In series of the primary construction geometry some secondary constructions will be curved grids. The grids are used as support for the glazing (over 1600 glass panels). The glass panels have different trapeziums geometries and slopes referable to the horizontal plane. 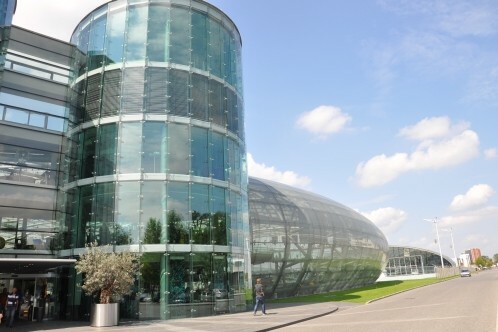 The glass panels are four to eleven times simply supported, with at the outside plane glass conical sunk fittings.